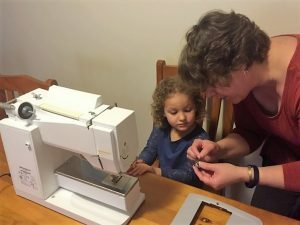 While I was at the WA Quilter’s Association (WAQA) open night in June one of the members, Lynnette, was explaining to me how she was teaching her grandchildren to sew. 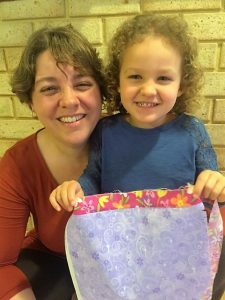 I was surprised to hear they had been around my youngest daughter’s age, 3½, when she started teaching them. Lynette told me she would sit them on her lap at the sewing machine. They would feed the fabric through and she would operate the foot pedal. Over time they learned to control the fabric and are now quite keen sewers. So I thought I’d give it a try. Michaela and I had lots of fun, for about half an hour. 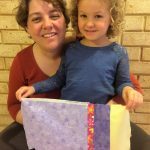 She really enjoyed choosing her own fabrics from my scrap box. The actual sewing part lasted 10 minutes tops. She decided she’d had enough after two lots of sewing with two different sets of fabric. Then changed her mind and wanted to join the two pieces together. Much to her delight she now has a light blanket for her dolls. 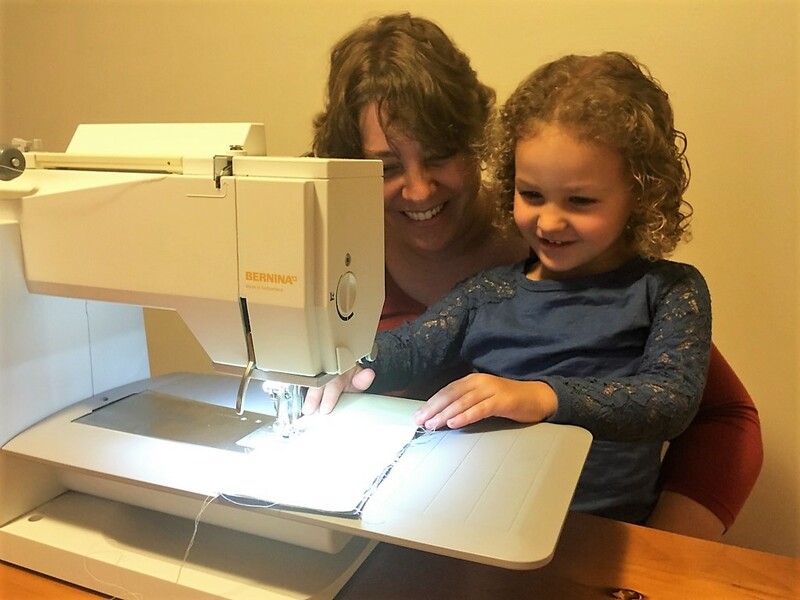 The purpose of your first (few) sessions is to let them get a feel for the machine, not teach them to sew a straight line. 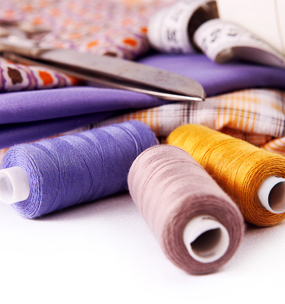 Michaela had the most fun choosing her own fabrics. Bright colours and novelty prints were her first choice. Be prepared. 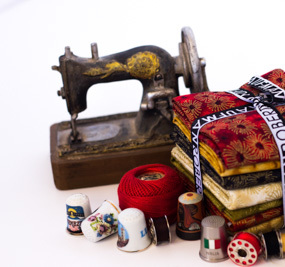 Have your machine set up before you start or they fiddle with knobs and controls while you are trying to thread the needle. Expect your first sessions to be short and sweet. Let them determine the length of the session. Stop when they want to. 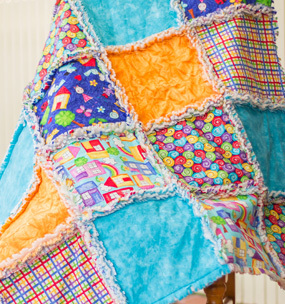 Let them experiment and move the fabric around as they sew to see what happens. Keep explanations short, sweet and in words they can understand. 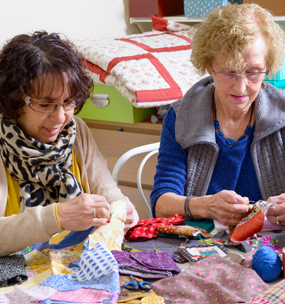 Safety first – give clear messages about keeping fingers away from the needle and only using the machine with an adult; start and end with the needle in the down position; use the slowest setting to move the fabric; tie their hair back out of their eyes if necessary. Praise them often, both directly and in front of others, for having a go. Make it fun! You will both want to do it again if you have fun. 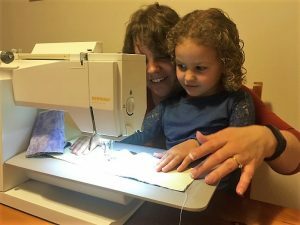 So, you can start teaching children to sew when they are quite young if you keep your sessions short, have realistic expectations about what you can accomplish and make it fun for both of you. Why not give it a go? If you need some fun novelty prints to get you started, make sure to pop into our store. I’m going to keep doing sessions with Michaela and see whether she takes to it. I’ll keep you posted on our progress. I would also love to hear how you go if you start teaching your children or grandchildren. If you have been teaching children for a while I’d love to hear what additional tips you may have. Please share your tips and stories with us in the comments below.